170 years passed since that August 1849, when Romagna, and especially its peoples, played a central role in one of the most important and edifying chapters of the Italian Risorgimento. Maybe, it was a story of bravery like many others that have always marked battles and wars, but that event, the so-called “Trafila” is an adventure with a mixture of charm and drama at the same time that could have been the ideal setting for an unreleased history film. Everything began on the morning of the 3rd August 1849, when Giuseppe Garibaldi, his wife Anita and a handful of loyal men started their journey across Romagna in order to escape and save themselves from almost certain capture by the Austrian and Pope’s troops. This was a crucial moment for the Italian history since it allowed the hero of the two worlds to save himself and, at the same time, to base the foundations for those events that, ten years later, led to the so desired Italian Unification. In the wake of the social revolutions of that period, the air of intolerance of power fan the flames of rebellion and of empathy that the people of Romagna felt for Garibaldi. This cause-effect process grew spontaneously without any central coordination and helped to hide fugitive Garibaldi from one to another. Dozens of people who didn’t know each other and, most of all, were of different social, cultural and political extraction, were involved in this operation. Forced to leave Rome by the French artillery, Garibaldi decided in July 1849 to start this fool venture and to go in defense of Venice, which was besieged by the Austrians. He departed with a handful of 4,000 men crossing the lands controlled by the enemies: it was a suicidal idea that collided with the reality very soon when he arrived in the country of Romagna. He decided to find temporary shelter in the Republic of San Marino and to give freedom to the men who remained loyal. More than 200 soldiers decided not to abandon him and, together with Garibaldi and his wife Anita, who was 6 months pregnant, they decided to fight the 15,000 Austrian soldiers, cutting through moats and rows of vineyards until arriving at the port in Cesenatico. On the dawn of the 2nd August, they departed on a boat headed to Venice, thinking they succeeded in escaping. The Austrian troops, though, intercepted them in Porto Garibaldi (Ferrara): some of them were captured, some others were able to escape overland – among them Garibaldi with Anita and field helper Giovan Battista Coliolo, called Leggero. Today, a real cult on Garibaldi’s trail exists between Romagna and the Po Delta Park: every city or village counts one Museum of the Risorgimento that praises the deeds and achievements of that period. From Cesenatico up to Comaccio, counting also Ravenna and Forlì, many cities hide places of great historical and patriotic importance. In CESENATICO, every year, the myth of Garibaldi is celebrated. Here, the leader set sail with his wife Anita and a handful of heroes headed to Venice. The first monument in Italy dedicated to this hero of the “Two Worlds” (1884) comes into view in the main square named after Carlo Pisacane, the place-symbol of the period of the Risorgimento. This historical event is truly felt by the local community and it is recalled every year on the first Sunday of August with an important feast that brings hundreds of red shirts “garibaldine” in town. 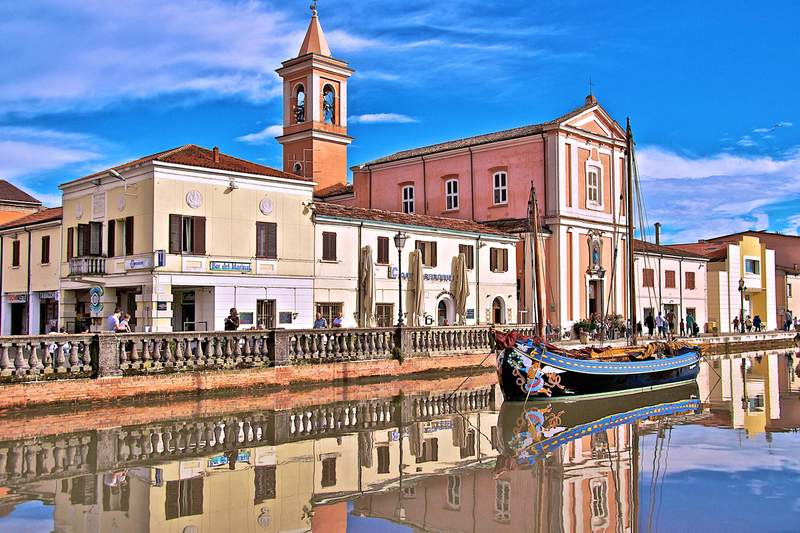 Another important stop is the Museo Della Marineria situated in the harbor canal that preserves its “open-air exhibition” made of historical fishing boats like the ones Garibaldi used: the boats are called bragozzi and tartane and the Italian leader used 13 bragozzi for his journey to Venice. Garibaldi never reached Venice because intercepted earlier by the Austrian and he disembarked in Magnavacca instead, today known as PORTO GARIBALDI, one of the seven beach resorts of Comacchio. In the heart of the Po Delta Park, with its lagoons, marsh areas and rich fauna that every year count many visitors who have a wide choice of outdoor activities to appreciate the local nature. Visitors may choose a boat excursion or a bike ride along the river banks, or they can do both choosing the option “Bike&Boat” in an extraordinary itinerary that alternates the two along the ring-shaped track that from the sea leads to Comacchio. Following the tracks of Garibaldi, there is another important place in Ravenna: it’s the submerged area of Valle Mandriole, and not far from there, the Fattoria Guiccioli is an interesting stop – here Anita died on 4 August 1849. This building can be visited on a reservation and it hosts many relics and mementos linked to the “Trafila”. Anita’s “Cippo” the stone in memory of the heroin under which she was buried stands few hundreds of metres from the Fattoria, in the “Landa della Pastorara”. Garibaldi returned in this place years later to bring the spoils of the wife to the cemetery of Niece. In RAVENNA, Garibaldi found several places where to hide and the most famous one is the hut “Capanno Garibaldi“. It is still standing immersed in the nature of Piallassa Della Baiona thanks to several renovation works. Today, it preserves many relics linked to the hero and is open for tours from mid-March to October. Moreover, Ravenna hosts also the Museum of the Risorgimento near the Classense Library. It displays arms, uniforms, photographs, paintings, personal letters, and documents. The gemstone of the exhibition is the cape and the hat that the people of Ravenna gave Garibaldi, together with the blanket with which Anita was covered. The last stop of Garibaldi is in the area of Forlì, where he passed through during his journey to the Grandduchy of Tuscany. He stopped two days in the village of MODIGLIANA , at Don Giovanni Verità’s house. The city museum is dedicated right to the priest and it preserves some of the most beautiful paintings by Silvestro Lega, displaying the famous portraits “Ritratto di Giuseppe Garibaldi” (1861) and “Ritratto di Don Giovanni Verità” (1885). FORLÌ has its Museo del Risorgimento as well with a rich collection about the men of Garibaldi from Forlì. The museum can be visited on a reservation and is situated in the wonderful rooms of the neoclassical Palace Gaddi. Finally, not to forget the new exhibition that the city dedicates in 2019 to the 19th century, and especially to the Risorgimento. Until 16 June, the Museums of San Domenico host the exhibition “Ottocento. L’arte dell’Italia tra Hayes e Segantini” with a long itinerary that inquires about the art during the Risorgimento and the Italian Unification until the Great War.